After months of suspense and speculation, we have an official announcement that Tecmo Bowl Throwback is coming to XBLA and PSN in Spring 2010. But now I won't have to just hold my old NES cart and cry, remembering bygone days of football yore, because I'll soon be able to download Tecmo Bowl Throwback on Xbox Live Arcade (or the PlayStation Network, if I were so inclined). Coming in "Spring 2010", there's no official word on how much it will cost, but, when it comes to this kind of game, does that really matter? There are only a little official details but Tecmo Bowl Throwback will support online play against friends while also having various online leaderboards. I've said it before: running online seasons would be great but there is no word on that front. There are 32 teams available to play, but, it is as I feared, Tecmo Bowl Throwback doesn't appear to have the NFL license. 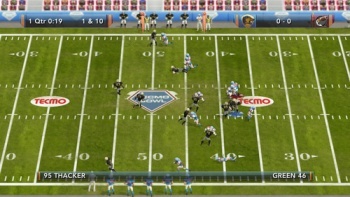 But with the ability to customize your roster, you might be able to recreate any team you want to. If they allow the distribution of custom rosters, then we'll soon see rosters mimicking current NFL players. Or better yet, historic rosters from 1991 or even 1986. That would be enough to make me do the Superbowl Shuffle. The best part of Tecmo Bowl Throwback is that although the graphics get an upgrade, the developers at Southend Interactive in Sweden have preserved the simple gameplay. You can play in 3D, but I'll probably go back to the topdown 2D mode. 'Cause that's how I like my American football, people: made by a Swedish team, published by a Japanese company and played without any basis in reality.